Bhutan has many comfortable hotels and lodges in all tourist destinations but there are no five star luxuries hotels categorized. Western Bhutan (Thimphu, Paro and Punakha) has better hotels with decent accommodation and cuisine than the central and eastern Bhutan. 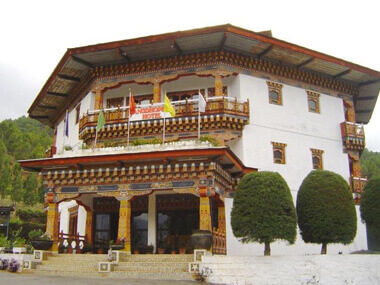 However, the lodging gets more rudimentary when one venture into central and eastern Bhutan, but to make our tourism industry better, the Department of Tourism (DOT) has particularly marked hotels for the tourists' food and lodging. When you travel to remote areas of central and eastern Bhutan with Classic Bhutan Tours, you can be sure of your accommodation which is well prepared and comfortable in lodges, guesthouses, smaller hotels and tented camps of well approved standards. We have carefully selected the accommodation units for your convenience with the best of locations, services and ambience.